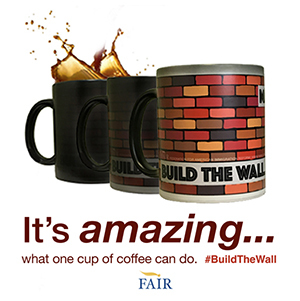 You are at:Home»Immigration Issues»Education»You Can’t Say Illegal Alien! You Can’t Say Illegal Alien! 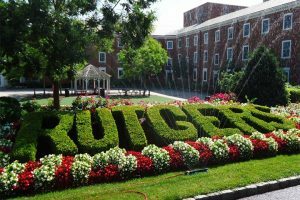 The Washington Times recently reported that the Rutgers University student paper fired one of its reporters for attempting to use the i-word. Student journalist Aviv Khavich committed the unpardonable sin of referring to aliens illegally present in the United States as “illegal aliens.” Apparently, the term has become a highly politicized and inflammatory. Khavich’s editors eventually replaced all instances of the offending verbiage with “undocumented immigrant,” prior to publishing his last column. What’s the problem with the substitution? It is a deliberate attempt by open-borders advocates to nullify the impact of immigration laws they don’t like by controlling speech. Improper Entry by an Alien is a crime punishable by up to six months in federal prison. Black’s law dictionary, the standard reference for legal terms, defines “alien” as “a foreign-born person who has not qualified as a citizen of the country.” Therefore, “illegal alien” is a factually and legally accurate description of a foreign national who has violated the law in order to enter the United States. By contrast, the term “undocumented immigrant” is wildly inaccurate. “Immigrant” is a legal term of art that refers to aliens who have been granted authorization to reside permanently in the United States. It’s impossible to be an “undocumented immigrant” because it’s the documents that make you an immigrant. This construction shifts attention away from the crime committed by border jumpers and visa overstayers. It suggests that, but for their failure to deal with some pesky bureaucratic paperwork, they would be just as legal as a native born American. And it implies that even if they have committed a crime, it is a minor infraction roughly akin to a speeding violation. George Orwell, in his book 1984, referred to this type of ambiguous, euphemistic use of words as “newspeak.” He also noted that language “becomes ugly and inaccurate because our thoughts are foolish.” Our government’s thoughts about immigration have been utterly foolhardy for nearly half a century. 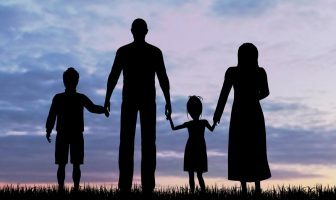 The replacement of “illegal alien” with “undocumented immigrant” is a perfect example of the ugly and inaccurate language that results from those thoughts. Kudos to Mr. Khavich for protesting the use of newspeak and standing up for the truth. Previous ArticleNoncitizen Voting: the Biggest Threat to the 2016 Elections? SHAME, SHAME, SHAME ON YOU, RUTGERS!!! Let’s see now: illegal alien, illegal alien, illegal alien. Hey, it still works! The greatest threat to this nation is the large and unfettered illegal alien population. The term illegal alien is the proper term use in US codes to discribe a foreign national unlawfully residing in our country. The news media and liberal institutions do not like the the term so they have come up with their own political correct term, their favorite has been undocumented immigrants but these people are not immigrants. Immigration is a process and agreement entered into by a foreign national and a sovereign state. People that jump the border or overstay their visa are therefore not immigrants because they did not enter the process. In the past decade the liberal media and the far left, decided that did not like that term either. Now, they call illegal aliens simply immigrants. The problem here is you never know what or rather who they are talking about, because they can distort the facts to fit their agenda. For example, they will combine the two groups and say studies show immigrants commit less crimes than the general population which is true for immigrants but not true for illegal aliens, that make up about 26% of our prison population. Illegal aliens will break any law that stands in their way and more troubling is that they are excused. Diving without a license, false ID, identity theft, insurance fraud, zoning violations and the list goes on and on. The reason why laws work is because there are consequences take away the consequences and there is no law. If they commit a serious crime they simply go back across the border, never to be found, or they often reemerge somewhere else under a different name. All our elected officials have let us down on this issue and it needs to stop. These illegal aliens are taking our jobs, plundering our resources and dividing this nation. Hopefully this will change under the Trump administration. God bless President Elect Trump and God bless this United States of America. As a retired chief of the US Border Patrol and 30 years of experience in immigration matters, I congratulate President Elect Trump on his achievement. First time in my memory, and I am an old guy, that a Presidential candidate has endorsed and supported the US Border Patrol. Over the years, depending on which political party was in power,hopefully, we will be allowed to do our job- protecting the borders of the US. Hopefully Trump will lift the order that agents retreat from rock throwers at the border. That’s giving border crossers what they want. I’ve seen people say “it’s only a rock”. Not when you don’t see it coming. I think the policy should be throw a rock and you get fired on. Yes indeed. Now, maybe, hopefully, we will regrow our brain on status-quo immigration issues and take fast corrective actions – before we are totally destroyed? Time to cut off the tail that has been wagging the dog. (rhetorical) Time to let the Border Patrol do their extremely difficult job. To uncuff them from all the leftwing/self serving nanny state crapola. Time for common sense to enter into immigration matters – ASAP. PRAISE GOD IN ALL HIS GLORY for the U.S. Border Patrol, and for the U.S. election of Donald Trump as the 45th President!!! I wonder if the Border Agents in Erie are going to continue looking for illegal aliens on the waters of Lake Erie instead of the bus terminals of Erie? 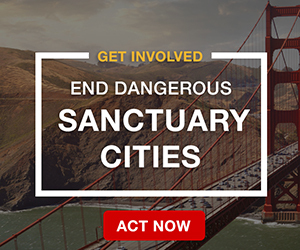 It looks like Trump will address the Sanctuary City mess. Maybe there should be legislation to remove funding from universities that won’t allow the use of the term “illegal alien” and those that find the American flag offensive. 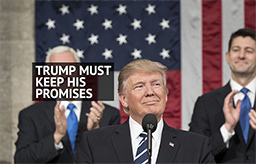 President-Elect Trump – and his immigration proposals – are likely to face severe opposition from Democrats, establishment Republicans, the Chamber of Commerce, Wall Street, and the Corporate Media, who are all still committed to Open Borders and Globalism. Trump will not have a super-majority in the Senate, so the Democrats could stop any pro-American immigration reform legislation by using filibusters. So, I suggest that we should keep on supporting FAIR and NumbersUSA the same as we would have if Hillary had won. There are still intense public policy battles that must be fought, so we must stay engaged in this process. I think Trump should use the Secret Service and his own Trump Security too….remember JFK and MLK…. Trump is the new President!!!!! This is great! Finally, a President in favor of real border security, no illegal immigration, etc. I have been a FAIR supporter for around 20 years, but I never really expected to see a President in favor of true immigration reform. This is great news for the future of our country! cops. ICE will be free to do their jobs. Ligaya Fabian of 1631 El Camino Real #8 Tustin Ca 92780 submitted fake documents and paid money to obtain a driver’s license but the dmv found out and revoked the license. She jumpshipped her flight from Germany to Canada at lax to get here. She now has a green card. …………….. The CBS station is reporting cases of voting machines rejecting attempts to vote straight Republican or changing Trump votes to Clinton. I have read about this also in some of the early voting around the country. Pretty much always seems to run one way. I don’t think Trump should just automatically concede without demanding that there is a full investigation of whether non citizens are voting [they definitely are] and that every voting machine give some kind of printed receipt confirming votes were done as intended. The time for just putting on a happy grin and being a gracious loser is over. It’s quite likely that some races around this country and possibly the presidency have been flipped by non citizens. Best way forward is to FORCE the States who don’t want to require a government issued photo ID is simply to pass a FEDERAL LAW that requires a FEDERALLY RECOGNIZED photo ID to vote in any election in which there are candidates for FEDERAL OFFICE. The Feds can refuse to recognize a photo put on a driver’s license that was issued to an ILLEGAL, since it would be a Federal violation for that person to drive on ANY Federally constructed road or highway, they can by extension refuse to allow them as proof for voting. What the State does in it’s OWN elections is up to the State. Having a 10 year sentence for violation, with mandatory and immediate deportation to follow upon release, might make them think twice. That and mandating that ALL ballots in Federal Elections be in ENGLISH ONLY. As well, make it illegal (for Federal applications) to use any government (State, County, Municipal) issued documents that are printed in ANY language other than English OR contain any other language on them. Clinton campaign skullduggery continues. A group supporting her is running a last minute television ad in South Florida, a heavily Jewish area, that is cropped to show Trump saying he is going to stop all Jews from entering the US, something he never said or remotely implied.